Take a quiet slow walk in nature it will nurture and heal your mind, body and spirit. A walk allows you to be in harmony as you return to an instinctive sense of what life is and how to live. I completed the 90 K Cooloola Great Walk over 5 days from Rainbow Beach to Tewantin with Cowan Caldwell and Tony Wiggins. It was a perfect walk for the 3 of us with wonderfully warm weather and beautiful vistas from high up on ancient dunes. I particularly enjoyed breathing the sweet and clean air of the rainforests and viewing the colourful wildflowers of the heath. We were able to cleanse and recuperate with clean and calm lakes, rivers and the ocean along the way. This type of slow walk is a form of walking meditation as it allows you to be in the moment and in tune with what is about you having a profound healing effect. 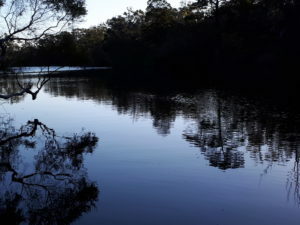 I felt so fit and cleansed from the walk and I would certainly recommend the Cooloola Great Walk (see https://www.npsr.qld.gov.au/parks/great-walks-cooloola/).